1. The first-born son of Manasseh (Josh. xvii. 1; I Chron. vii. 14); founder of the most important or dominant branch of the tribe of Manasseh. His importance is shown by the collocation of Ephraim and Machir (instead of Manasseh) in Deborah'e Song (Judges v. 14), which seems to imply that the whole tribe was once known by his name. 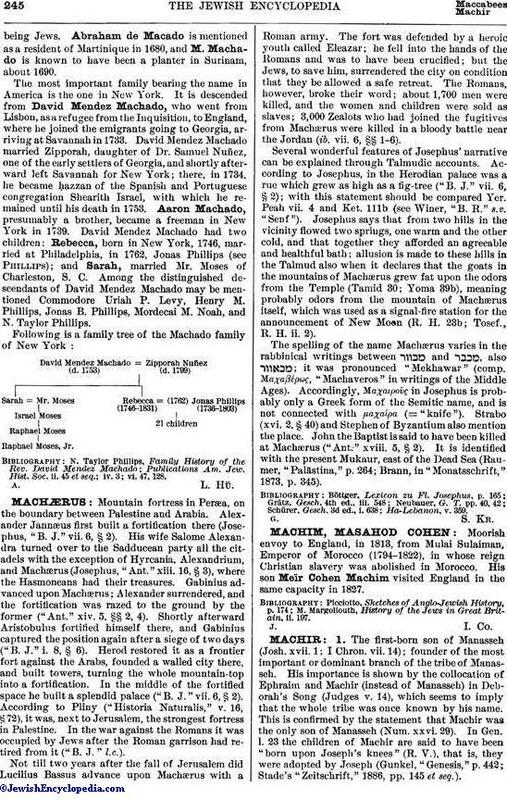 This is confirmed by the statement that Machir was the only son of Manasseh (Num. xxvi. 29). In Gen. 1. 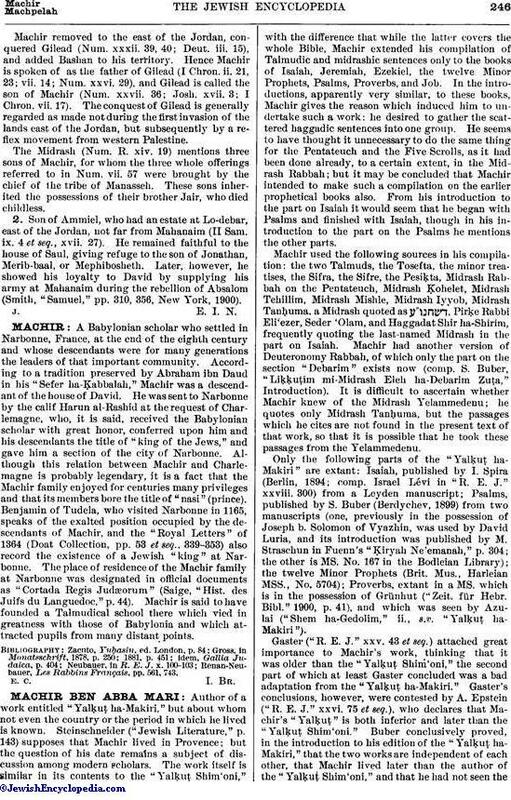 23 the children of Machir are said to have been "born upon Joseph's knees" (R. V.), that is, they were adopted by Joseph (Gunkel, "Genesis," p. 442; Stade's "Zeitschrift," 1886, pp. 145 et seq. ).Machir removed to the east of the Jordan, conquered Gilead (Num. xxxii. 39, 40; Deut. iii. 15), and added Bashan to his territory. Hence Machir is spoken of as the father of Gilead (I Chron. ii. 21, 23; vii. 14; Num. xxvi. 29), and Gilead is called the son of Machir (Num. xxvii. 36; Josh. xvii. 3; I Chron. vii. 17). The conquest of Gilead is generally regarded as made not during the first invasion of the lands east of the Jordan, but subsequently by a reflex movement from western Palestine.The Midrash (Num. R. xiv. 19) mentions three sons of Machir, for whom the three whole offerings referred to in Num. vii. 57 were brought by the chief of the tribe of Manasseh. These sons inherited the possessions of their brother Jair, who died childless. 2. Son of Ammiel, who had an estate at Lo-debar, east of the Jordan, not far from Mahanaim (II Sam. ix. 4 et seq., xvii. 27). He remained faithful to the house of Saul, giving refuge to the son of Jonathan, Merib-baal, or Mephibosheth. Later, however, he showed his loyalty to David by supplying his army at Mahanaim during the rebellion of Absalom (Smith, "Samuel," pp. 310, 356, New York, 1900).